"Do I make you feel like living?" Omnia Causa Fiunt. Everything happens for a reason. That simple phrase encompasses and means so much more. There will be moments in our life where we will question the loss, the hurt, the heartache, the pain, the what if moments, and so many others. Friends may come and go. New strangers may appear in your life and change you. Fate could be leading you to a different direction and open your eyes to a whole new world of possibilities. So in a sense, everything happens for a reason, even when we are not able to make sense of it. 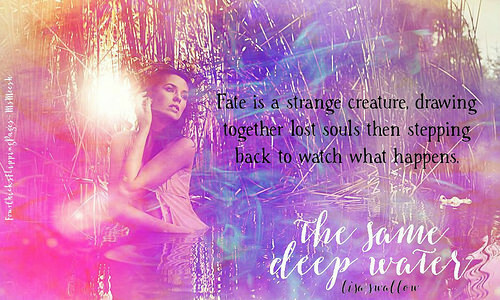 And in Lisa Swallow's newest release, The Same Deep Water, she reminds us all that we don't meet people by accident. They are meant to cross our path for a reason. "Do you know what's special about kissing in the rain?... Loving somebody is easy when the sun is shining, but when you're caught up in the storm, you discover who's prepared to stand with you." Thought-provoking!!! That is the one word that immediately comes to mind when I read The Same Deep Water. This book took my heart immediately and left a mark. It was one of those touching reads that really affected me. It left me feeling so raw, exposed and vulnerable. Right off the opening pages, I knew I was going to experience a whirlwind of emotions since this book really left a strong impression on fate. Honestly, this book took you to a whole new level where it transcends your heart, soul, and mind about life. "Swimming the same deep water as Guy was hard, but struggling in the depths with him is better than losing myself amongst those who never find their way out of the shallows." This book is not your typical romance story. It is a story that is centered on two broken people who both have secrets, a painful and saddening past, and who are struggling with living. 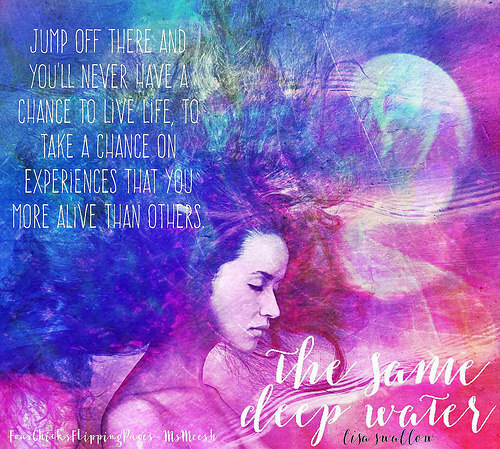 In a sense both characters are drowning but together they find salvation,healing and acceptance. Together, they learn how to face their fears together and separately. I honestly don't want to spoil the story since this book is about experiencing the pain, the hurt, the disappointment, the happiness, the ups and downs, and the everything in between. So if you are looking for a book, where you are reminded that you were given THIS LIFE because you're strong enough to live it then I highly recommend you to read this book because this book is just a reminder that's it okay to ask for help.